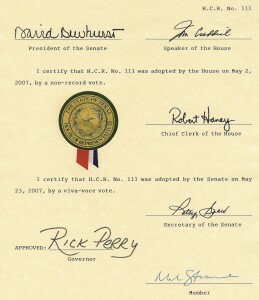 HCR 111, which passed both houses of the Texas Legislature earlier this year, giving legislative approval to the site and scope of the Bill of Rights Plaza proposal developed by MyBillofRights.org for the Texas Capitol, has been signed by Texas Governor Rick Perry. The next step for this proposal is to get the approval for our preliminary design proposal from of all major stakeholders, including the Capitol Preservation Commission and the Texas Facilities Commission. Click on the signatures image to view and download a PDF of the full text of HCR 111.